If you only make it to one Japanese city in your lifetime, it’s gotta be Kyoto. The former imperial capital is more than just one of Japan’s best tourist destinations, it’s one of the best cities to visit in world. Period. Even if you’ve think you’ve seen it all, Kyoto will have something up its sleeve to leave you in awe. When you emerge into the city for the first time, Kyoto probably won’t match up with the Japan of your dreams. The city is, at the surface, modern, and hardly seems like the mystical place the tourist brochures portray. Don’t let first appearances fool you. The best things to do in Kyoto aren’t found on the busy city streets, but hidden in the back alleys and behind green parks. Stroll around Kyoto a little, and you’ll soon discover Japan as you’ve always imagined it. There’s no way you’ll leave Kyoto without yearning for more. Exploring with no fixed schedule opens Kyoto to you. Whether you have one day in Kyoto, a weekend in Kyoto or a whole week to roam free, there’s no end to the adventures you’ll tackle. Kyoto is home to over 400 shrines and over 1,600 temples. No matter where you find yourself in the city, there’ll be something nearby that transports you to another time and place. 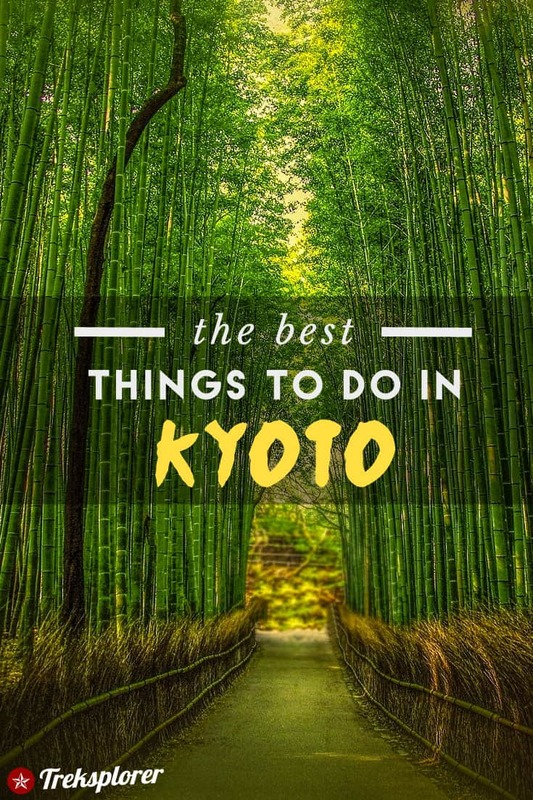 It’s no wonder Kyoto almost always tops list of what to do in Japan! 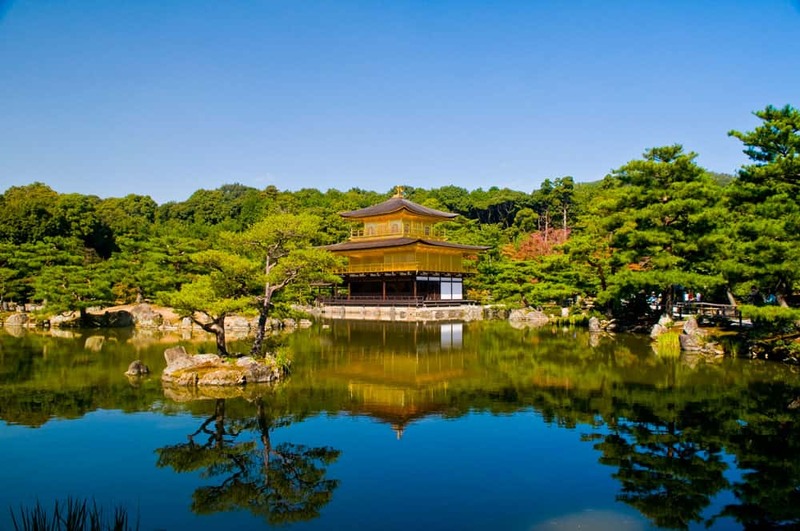 Nothing expresses Kyoto’s artistic side as well as the stylish Kinkaku-ji, or the Golden Pavilion. The 13-metre tall dome stands next to a pond exactly where the 14th-century original stood before being torched by a monk. The three-level construction is gold-leafed all throughout, presenting a gorgeous façade that’s enhanced by rippled reflection in the pond below. The golden reflections in summer at this UNESCO World Heritage Site are a scene to behold, but the sight of snow caps in the lush green background during winter is equally beguiling. Getting To Kinkaku-ji: To get to Kinkaku-ji, board bus number 101 or 205 at Kyoto station and get off at Kinkaku-ji Michi bus stop. Not far from Kinkaku-ji in northwestern Kyoto lies Ryoan-ji, translated as the temple of the peaceful dragon. The current structure dates back to 1488 after the original temple was destroyed during the Onin wars of 1467. The mirror-shaped Kyoyochi Pond, dotted with numerous water birds, welcomes you to the grounds before reaching the monk quarters. Ryoan-ji Temple is also home to Karesansui, one of the most spectacular Zen gardens in Japan. The garden has 15 mysterious stones, laid in such a way that only 14 can be seen at the same time. Amazingly, the branches in the garden cast borrowed shadows filled with moss. The patterns on the rocks never remain the same twice. Getting to Ryoan-ji: From Keihan Sanjō Station, catch bus 59. Exit at Ryōan-ji-mae, just outside the entrance. If you’re already at Kinkaku-ji, it’s about a half-hour walk down Hontsuji Dori to the temple. 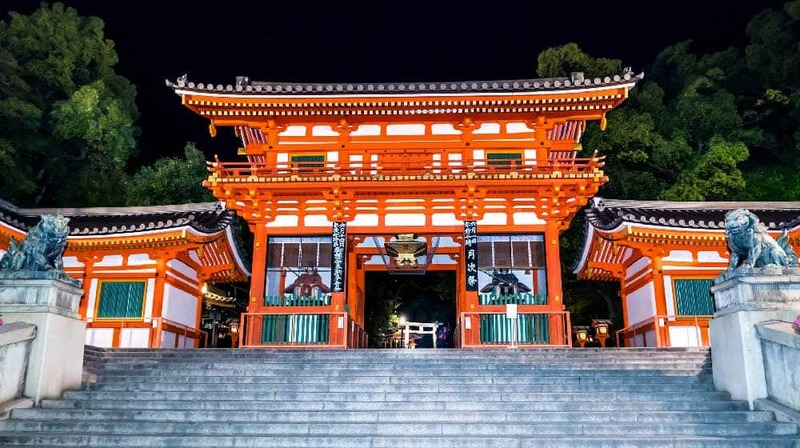 Built around 1500, the Fushimi Inari-taisha Shrine is one of the oldest tourist attractions in Kyoto. It is popular for the over 10,000 gates that open to each other. Walking through the shrine is an adventure in itself, winding up a mountain that will you take around three hours to climb. Along the structure are smaller shrines with vendor shops and areas to relax. 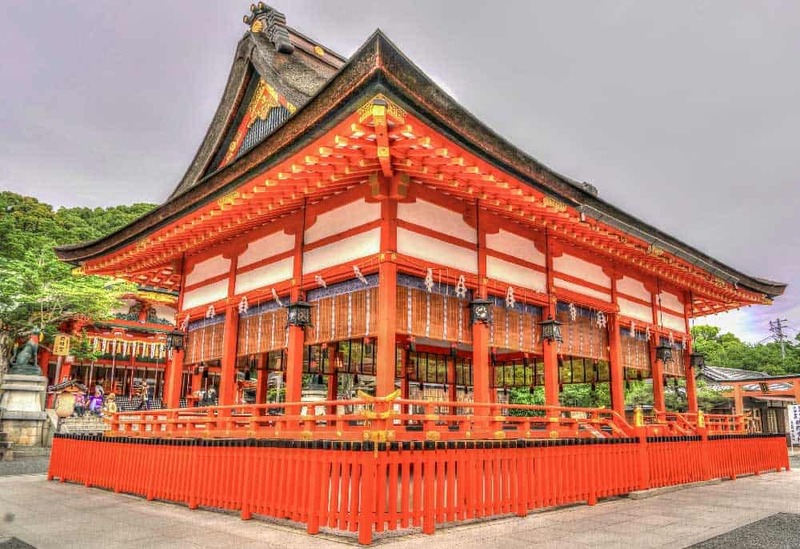 Many superstitious folks believe that visiting Fushimi Inari-taisha brings success in business. Try your luck and donate to the shrine to get your name etched onto your own vermillion gate. Getting to Fushimi Inari-taisha: From Kyoto Station, hop onto the JR Nara line to Inari Station. As you exit the station, you should see a large red torii that will lead you to the shrine. At the far western part of Kyoto is the Arashiyama Mountains where the famous Arashiyama trails lie. A beautifully-trimmed bamboo forest welcomes you to the land of natural beauty with several sites to visit. Monkeys at Kameyama-koen Park near the mountain top freely entertain you as you gaze at the spectacular Togetsu-kyo Bridge below. Near the bamboo grove is the Tenryu-ji Temple, surrounded by a stretch of fine gardens. Sneak into Gio-ji Temple for a glimpse of traditional dancing, or head to the right towadrds Adashino Nenbutsu-ji Temple & Otagi Nenbutsu-ji Temple for their one thousand famous stone statues. A view of the 9th-century Daikaku-ji Temple or a visit to the O-kouchi Mountain Villa will leave you equally spirited. Getting to Arashiyama: From Kyoto Station, take bus 28 to Arashiyama Station. Alternatively, you can catch bus 11 from Keihan Sanjō Station. Tenryu-ji is just west of the station. Once you’ve reached Tenryu-ji, you’ll find the bamboo grove outside the north gate. While exploring Kyoto, there’s a good chance that you’ll stumble upon Yasaka Shrine (also known as Gion Shrine). 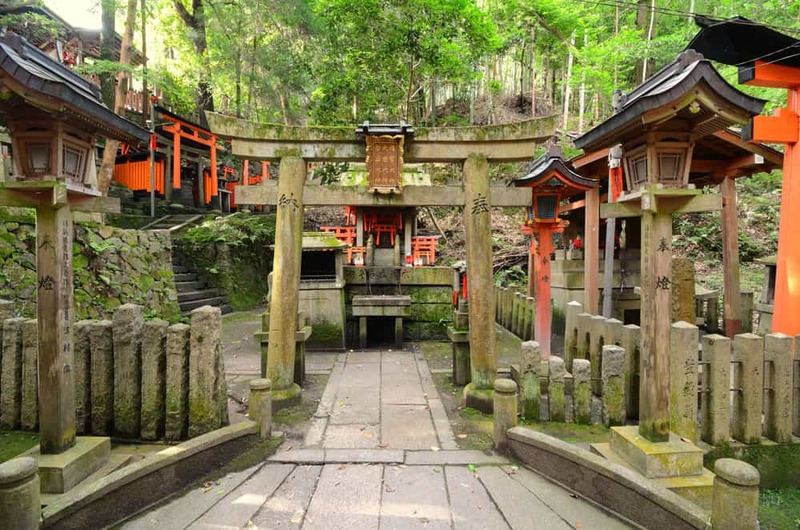 With a history dating back about 1350 years, visiting this Shinto shrine is a must for anyone passing through. Compared to other more grandiose shrines & temples in Kyoto, the small & subdued Yasaka Shrine feels a tad less dramatic. Time your visit in the evening, when the shrine’s dance hall gets lit up with hundreds of lanterns donated by local businesses hoping for a dash of extra luck. Even better is to visit in July when the Gion Matsuri festival kicks off. It’s one of the most popular festivals in Japan with a history dating back over a millennium, famous for its procession of colourful floats on July 17 and July 24. Yasaka Shrine is also a great area to explore during Kyoto’s cherry blossom season. Neighbouring Maruyama Park is one of the city’s top places for checking out the sakura. Getting to Yasaka Shrine: The closest subway stop from the shrine is Gion-Shijo Station. From the station, stroll walk east along Shijo Dori (a great place for a snack, by the way) until you see the shrine straight ahead. No other castle in Kyoto can give you a better glimpse into medieval Japanese history as Nijo Castle. While the major tower was destroyed centuries ago, the fortification walls and moats still remain intact. Constructed in 1601, Nijo Castle is an enormous collection of structures that demonstrate the power of the shogun war lords. Inside the castle grounds are the five buildings of Ninomaru Palace, the Tozamurai guard house, and the Ohiroma grand chamber. The interiors feature decorative panels and the spectacular nightingale floors that squeak when intruders step down. The castle is open from nine to five apart from a few select days. Getting to Nijo Castle: At Kyoto Station, you can catch bus 9, exiting at the Nijō-jō-mae stop. You’ll find the entrance to the castle on Horikawa Dori, the large avenue to the northeast. Built in the 1480s by Ashikaga Yoshimasa as Jishoji temple, Ginkaku-ji is an iconic structure in Kyoto. Although less impressive than Kinkaku-ji, both are must-sees while temple hopping in Kyoto. 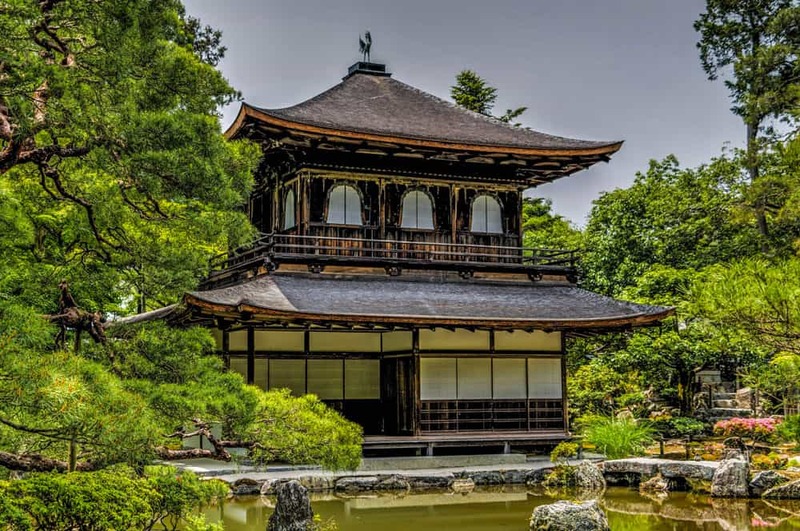 Scholars believe the initial plan was to have the temple covered in silver leaf but the shogun ran out of money before completing the project. Nevertheless, the silver-less Zen temple is a true representation of Higashiyama culture and a relic of the library style. The surrounding garden is equally striking, featuring a Sea of Silver Sand and a moon platform which is believed to reflect moon light to the Silver Pavilion. Ginkaku-ji Temple is open all year round. Visit in the morning before the crowds envelop the grounds if you want a little peace and quiet. Getting to Ginkaku-ji: Bus 5 leaves from both JR Kyoto and Keihan Sanjō Station. You’ll need to exit at the Ginkaku-ji-michi bus stop. Primarily serving as a teahouse district for travellers visiting the Yasaka-jinja Shrine in the 18th century, Gion District has since morphed into a modern neighbourhood in the heart of Kyoto. Nevertheless, Shinbashi-dori, on the northern border of Gion, has perfectly preserved the beauty and customs of medieval Japan. Don’t miss your opportunity to spot geisha sneaking along the street before they mysteriously disappear in a rustle of cloth. 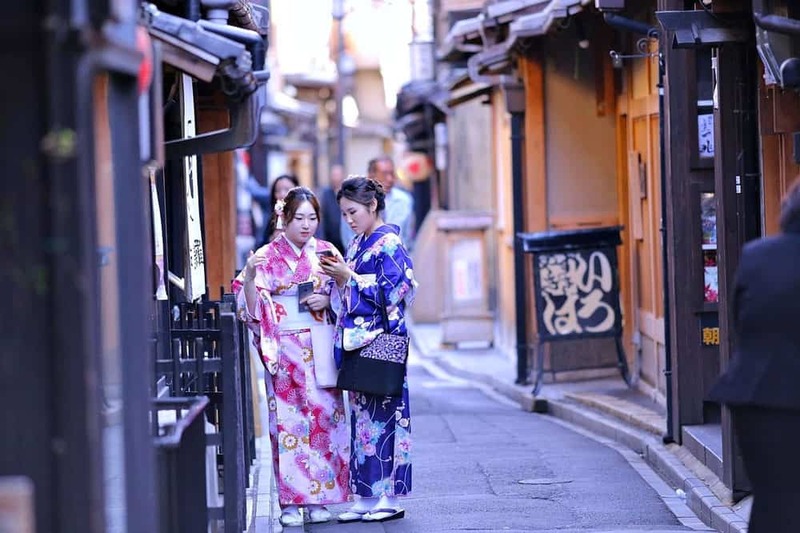 Although an authentic geisha entertainment experience is often out of reach for most foreigners, simply catching a glimpse of them while wandering around Gion District in the evening bestows a special feeling. Also close by is the cherry-tree-lined Shirakawa Minami-dori, arguably the most beautiful street in Asia and one of the most stunning things to see in Kyoto. Cherish a visit to the adjacent Shirakawa River in the evening for some peaceful moments of silent reflection. Getting to Gion District: From Kyoto Station, it’s about a 30-minute walk to Gion. Otherwise, grab a train on the Keihan Line to Gion-Shijō Station from Shichijo Station in central Kyoto. 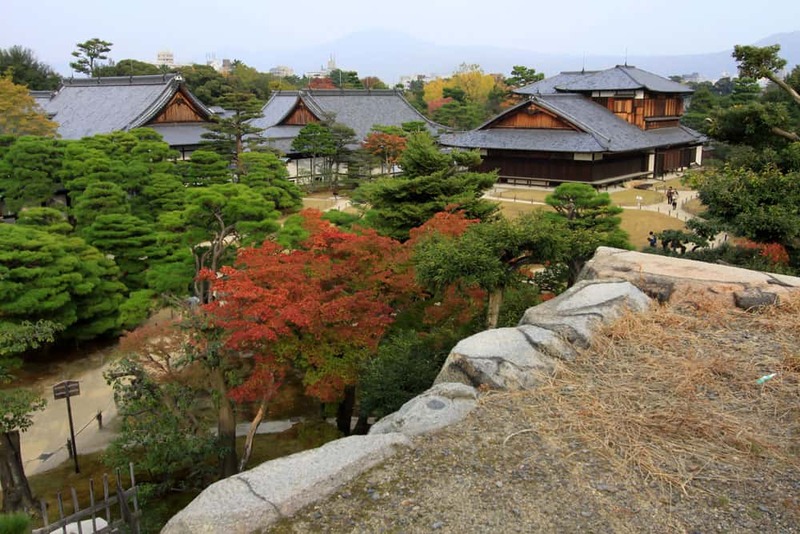 The city’s history as the former imperial capital of Japan becomes immediately obvious when you step onto the grounds of the Kyoto Imperial Palace (also known as Gosho in Japanese). Once home to the emperor of Japan, this walled complex throws together a mishmash of gates, shrines, gardens, and halls that remind of its former glory. 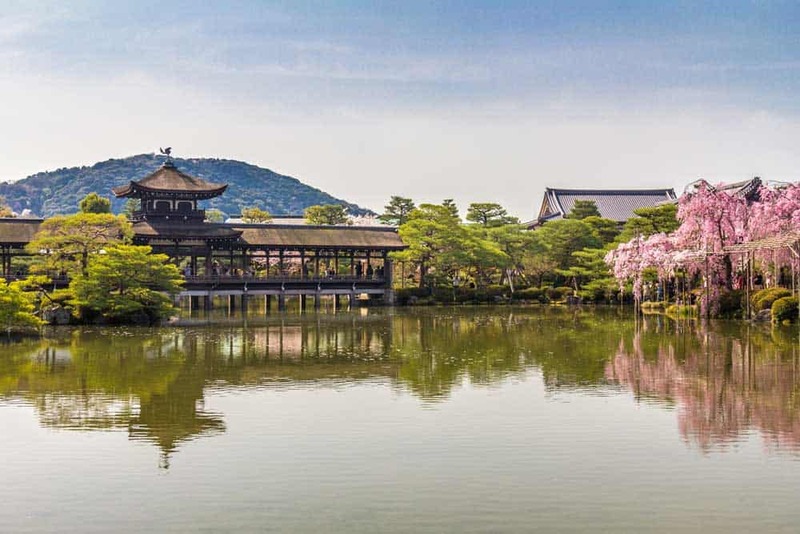 If Kyoto Imperial Palace factors in later on your itinerary, you might feel a little underwhelmed compared to the other more glorious temples, gardens & shrines elsewhere in the city. Nonetheless, now that travellers are able to freely enter and explore the complex (but not the building themselves) without admission, it’s worth the short jaunt northward to see for yourself. Getting to Kyoto Imperial Palace: The closest station to the palace grounds is Imadegawa Station on the Karasuma Line. From here, it’s about a 5- to 8-minute walk to the entrance gates. With nearly four hundred years behind it, Nishiki Market isn’t your typical Japanese market. Kyoto’s most famous culinary delicacies and rarest seafoods always find their way into the market stalls here. Most of the foods stalls are stacked with orange carrots, grilled squid, rice balls, sugared fruit, or omelets. You’ll be easily overwhelmed walking through Nishiki Market by the welcoming sights and smells of delicious Japanese food, and the lively chatter of the merchants shouting irasshaimase to beckon you to grab a tasty snack. For a break from the edibles, stroll into one of Nishiki Market’s stationary shops to rustle through the never-ending selections of Japanese paper printed with colourful designs and, if you’re lucky enough to spot it, entertainingly bad English translations that can brighten anyone’s day. Getting to Nishiki Market: The market is one block north of Shijo-dori in central Kyoto. The market runs on Nishikikōji-dōri between Takakura-dōri to the west and Teramachi-dōri to the east. The closest stations are Shijo Karasuma and Kawaramachi on the Hankyu Kyoto Line. Even in Kyoto, where temples seem to sprout from the pavement at every turn, Kiyomizu-dera will wow you. You can’t help becoming entranced by the temple’s entrance, jutting out of a mountain with 13-metre columns supporting it. The veranda at Kiyomizu-dera Temple is so impressive that the locals use the expression “jumping from the balcony of Kiyomizu” to mean a daring adventure. Below the balcony runs the Otowa Waterfall. Do as the locals do and take a sip of water to test the popular theory that they have healing powers. Next to the main hall are three smaller halls, Amida-do, Okuno-in, and Shaka-do. All three have deep religious roots connected to Buddha worship. If you can, visit Kiyomizu-dera in the evening when it takes on a stunning glow or in autumn when you can witness a panorama of Kyoto erupting in fall colours. Getting to Kiyomizu-dera: From Kyoto Station, bus 206 will take you towards Kiyomizu-dera. You can exit at either the Kiyōmizu-michi or Gojo-zaka bus stop, although Gogo-zaka is closer to the temple. From the bus stop its a 10-minute walk uphill. Even better is to undertake the 20-minute walk from Gion through the atmospheric streets of the Higashiyama District. Looking to escape the big city buzz? 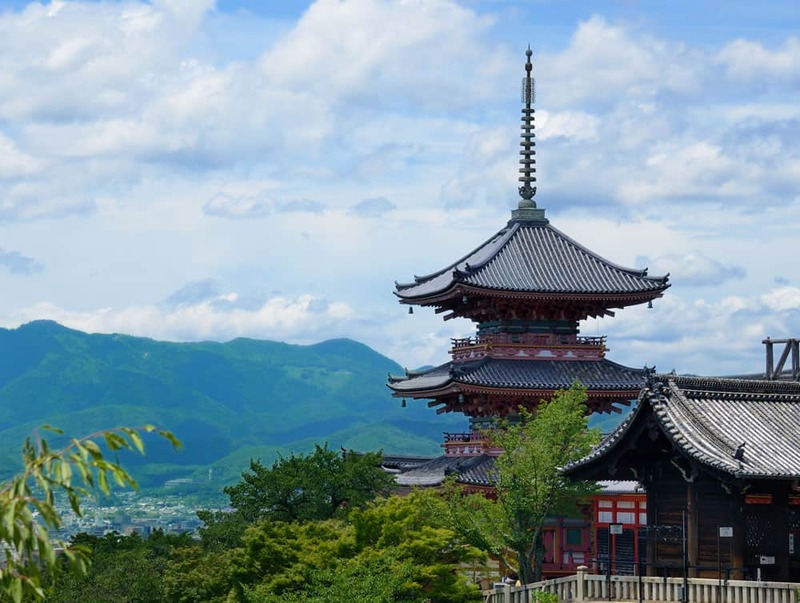 Among the best day trips from Kyoto is Mount Hiei, located about 1.5 hours northeast of the city centre. From its stunning mountain scenery to its wildlife & vegetation, Mount Hiei offers something special whatever time of year you visit. Besides hosting some of the top hiking trails in Kyoto, Mount Hiei (Hieizan) is also home to Enryaku-ji Temple. This UNESCO World Heritage Site is famous for giving birth to the Tendai sect of Buddhism in 788. The temple complex spreads over three main areas (Todo, Saito, and Yokawa) among blissful ancient forests. Not surprisingly, Enryaku-ji is among its most beautiful in fall when the leaves burst into bright red, orange & yellow hues. Getting to Mount Hiei: There are several ways to reach Hieizan from Kyoto. The only one that operates all year round is the Sakamoto Cablecar. To get here, take the JR Kosei from Kyoto Station to Hieizan-Sakamoto. From here, it’s 15 minutes by foot or 5 minutes by bus to the lower terminus of the Sakamoto Cablecar (¥1,620 return). The Todo area of Mount Hiei is about a 5- to 10-minute walk from the upper station. Wedged between Kiyomizu-dera and Fushimi Inari Taisha, Tofuku-ji Temple is must-see during any visit to Kyoto. 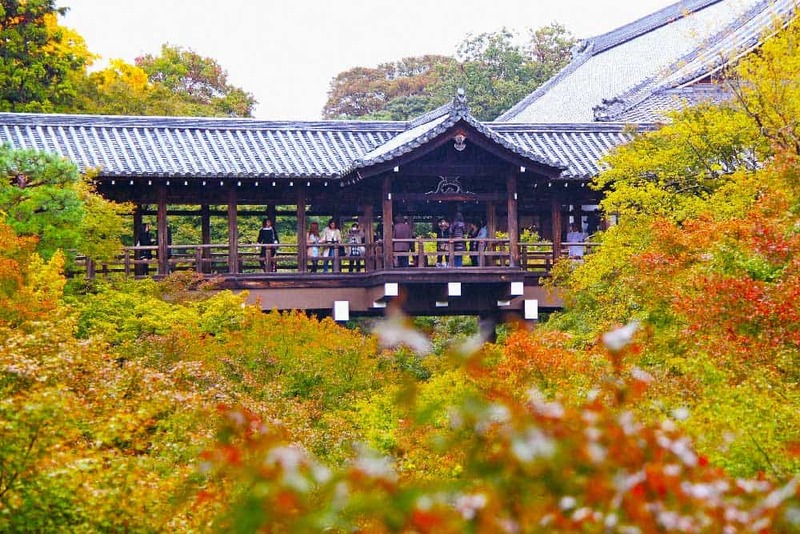 This large Zen Buddhist temple, founded in 1236, is a particularly popular destination in autumn under a blanket of fall colours. Among the most impressive sights at Tofuku-ji are the small vermillion-coloured Tsutenkyo Bridge, the 22-metre-high 15th-century Sanmon Gate, and the reconstructed Hondo (Main Hall). While you’re checking out Tsutenkyo Bridge, don’t miss out on the lovely Zen gardens in front of Kaisando Hall. Entrance to this part of the complex is just ¥400. Getting to Tofuku-ji: The quickest way to get here is via the JR Nara Line or Keihan Main Line from Kyoto Station (¥140) to Tofukuji Station. From the station, it’s a short ten-minute walk to the temple complex. Lying to the north in Kyoto is a scenic mile-long stretch named Philosopher’s Walk in honour of Nishida Kitaro, a Japanese philosopher. 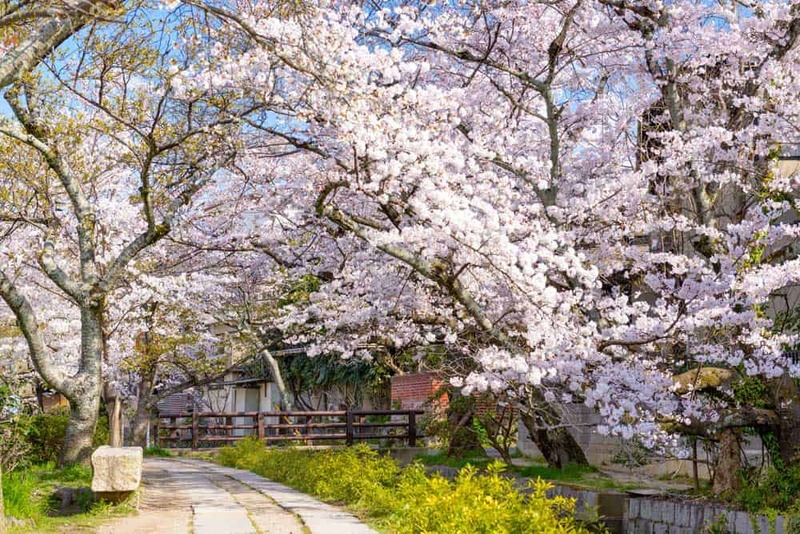 The ever cheerful Lake Biwa Canal alongside the pathway is a scene to behold, but it’s the blossoming cherry trees, if you time your trip to Japan right, that will attract you most. Walking on this path in spring will refresh you as the wind blows flower petals around you. Reflect on life among the tranquility of the Philosopher’s Walk or grab a drink from the adjacent cafes to keep refreshed. Getting to Philosopher’s Walk: The Philosopher’s Path runs between Ginkaku-ji and the Nanzeji neighborhood. The best approach is to take bus 5 from JR Kyoto or Keihan Sanjō Station to the Nanzen-ji Eikan-dō-michi bus stop. Explore Nanzen-ji Temple, one of the most interesting in Kyoto, before wandering towards the Philosopher’s Walk. The start of the path is about a 5- to 10-minute walk north of Nanzen-ji. Guest House Oumi: A budget ryokan in the heart of Nakagyo. Features an incredible garden terrace that whisks you away from the buzz of Kyoto city life. Located less than a kilometre from Nijo Castle. Royal Park Hotel The Kyoto: A modern 4-star hotel featuring large comfortable rooms in a central Nakagyo location and a delicious on-site restaurant headed by an award-winning chef. Four Seasons Hotel Kyoto: One of Japan’s best 5-star hotels fusing modern elements with Japanese sensibilities for an experience that’s uniquely Kyoto. Rooms looking out onto the central Shakusuien Japanese garden and pond are simply divine. Searching for the otherworldly? 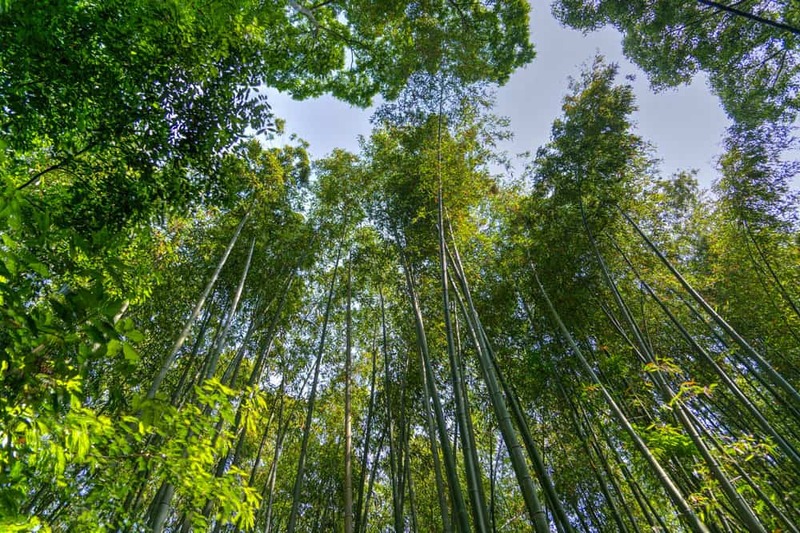 Hang with a thieving troop of monkeys and walk through the immense bamboo grove of Arashiyama. Want an incredible panorama of Kyoto? Find your way to Kiyomizu-dera, one of the most beautiful temples & shrines in Kyoto, for big views of the city. Visiting during hanami? Contemplate life among the Kyoto’s spring cherry blossoms on the Philosopher’s Walk and along Shirakawa Minami-dori in Gion District. Need a quick classic Kyoto experience? Walk through the thousands of vermillion red torii at Fushimi Inari-taisha and gaze upon the golden reflections at Kinkaku-ji.